The cerebellum, once thought to be limited to controlling movement, is involved in every aspect of higher brain function, according to a new study. The cerebellum can't get no respect. Located inconveniently on the underside of the brain and initially thought to be limited to controlling movement, the cerebellum has long been treated like an afterthought by researchers studying higher brain functions. But researchers at Washington University School of Medicine in St. Louis say overlooking the cerebellum is a mistake. Their findings, published Oct. 25 in Neuron, suggest that the cerebellum has a hand in every aspect of higher brain functions -- not just movement, but attention, thinking, planning and decision-making. "The biggest surprise to me was the discovery that 80 percent of the cerebellum is devoted to the smart stuff," said senior author Nico Dosenbach, MD, PhD, an assistant professor of neurology, of occupational therapy and of pediatrics. "Everyone thought the cerebellum was about movement. If your cerebellum is damaged, you can't move smoothly -- your hand jerks around when you try to reach for something. Our research strongly suggests that just as the cerebellum serves as a quality check on movement, it also checks your thoughts as well -- smoothing them out, correcting them, perfecting things." Dosenbach is a founding member of the Midnight Scan Club, a group of Washington University neuroscientists who have taken turns in an MRI scanner late at night, scanning their own brains for hours to generate a massive amount of high-quality data for their research. A previous analysis of Midnight Scan Club data showed that a kind of brain scan called functional connectivity MRI can reliably detect fundamental differences in how individual brains are wired. Postdoctoral researcher and first author Scott Marek, PhD, decided to apply a similar analysis to the cerebellum. In the better-known cerebral cortex -- the crumpled outer layer of the brain -- wiring maps have been drawn that connect distant areas into networks that govern vision, attention, language and movement. But nobody knew how the cerebellum is organized in individuals, partly because a quirk of MRI technology means that data obtained from the underside of the brain tend to be low quality. In the Midnight Scan Club dataset, however, Marek had access to more than 10 hours of scans on each of 10 people, enough to take a serious look at the cerebellum. Using the cortex's networks as a template, Marek could identify the networks in the cerebellum. Notably, the sensory networks are missing -- vision, hearing and touch -- and only 20 percent of the cerebellum is devoted to movement, roughly the same amount as in the cerebral cortex. The remaining 80 percent is occupied by networks involved in higher-order cognition: the attention network; the default network, which has to do with daydreaming, recalling memories and just idly thinking; and two networks that oversee executive functions such as decision-making and planning. "The executive function networks are way overrepresented in the cerebellum," Marek said. "Our whole understanding of the cerebellum needs to shift away from it being involved in motor control to it being more involved in general control of higher-level cognition." The researchers measured the timing of brain activity and found that the cerebellum was consistently the last step in neurologic circuits. Signals were received through sensory systems and processed in intermediate networks in the cerebral cortex before being sent to the cerebellum. There, the researchers surmise, the signals undergo final quality checks before the output is sent back to the cerebral cortex for implementation. "If you think of an assembly line, the cerebellum is the person at the end who inspects the car and says, 'This one is good; we'll sell it,' or 'This one has a dent; we have to go back and repair it,'" Dosenbach said. "It's where all your thoughts and actions get refined and quality controlled." People with damage to their cerebellum are known to become uncoordinated, with an unsteady gait, slurred speech and difficulty with fine motor tasks such as eating. The cerebellum also is quite sensitive to alcohol, which is one of the reasons why people who have had too many drinks stumble around. But the new data may help explain why someone who is inebriated also shows poor judgment. Just as a person staggers drunkenly because his or her compromised cerebellum is unable to perform the customary quality checks on motor function, alcohol-fueled bad decisions might also reflect a breakdown of quality control over executive functions. Marek also performed individualized network analyses on the 10 people in the data set. 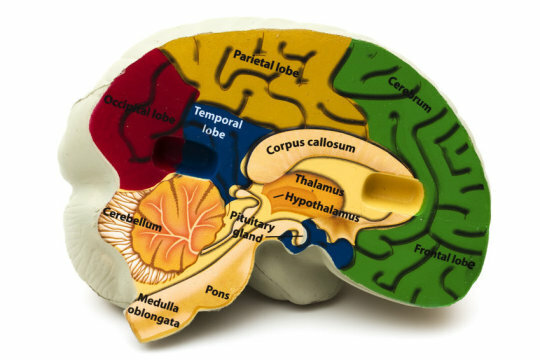 He found that while brain functions are arranged in roughly the same pattern in everyone's cerebellum, there is enough individual variation to distinguish brain scans performed on any two participants. The researchers are now investigating whether such individual differences in cerebellar networks correlate with intelligence, behavior, personality traits such as adaptability, or psychiatric conditions. "Many people who are looking at links between brain function and behavior just ignore the cerebellum," Dosenbach said. "They slice off that data and throw it away, because they don't know what to do with it. But there are four times as many neurons in the cerebellum as in the cerebral cortex, so if you're leaving out the cerebellum, you've already shot yourself in the foot before you started. The promise of imaging the whole human brain at once is to understand how it all works together. You can't see how the whole circuit works together when you're missing a major piece of it."